LARGE ORNATE WALL PLAQUE. 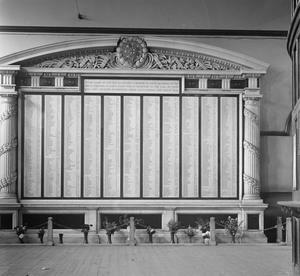 ROLL OF HONOUR 1220 NAMES IN BLACK LETTERING ON 11 PANELS SURMOUNTED BY SEGEMENTAL PEDIMENT WITH RELIEF OF LAUREL AND THE Great Eastern Railway COAT OF ARMS IN CENTRE . 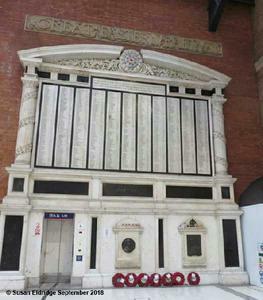 Moved c1990-91 from original site in the booking hall to a wall above the main concourse when the station was re-developed. Memorials to Field Marshal Sir Henry Wilson and to Captain Charles Fryatt (see reports11788 and 11789 ) are also relocated here. Comments: £500 of the cost was for the lettering. 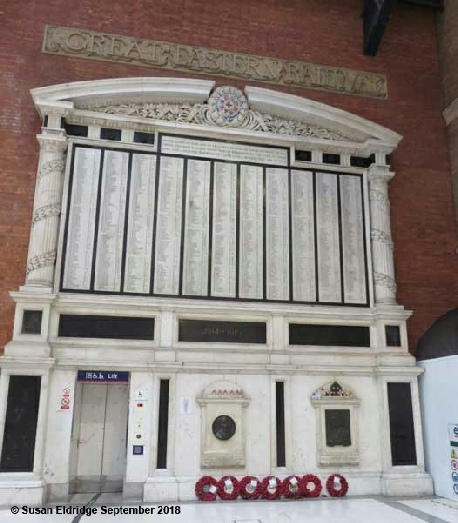 The company itself paid for the memorial. Rail No.578 pp.26-27 (7-20 Nov. 2007).